Before this twentieth anniversary is over, I thought I'd give you my version of how history should be written. Obviously, you might question my authority on the issue as I hardly had a musical taste at the time, maybe not even a conscious mind. But I think I've learned quite a lot about it so far, and there is still a lot more to discover. 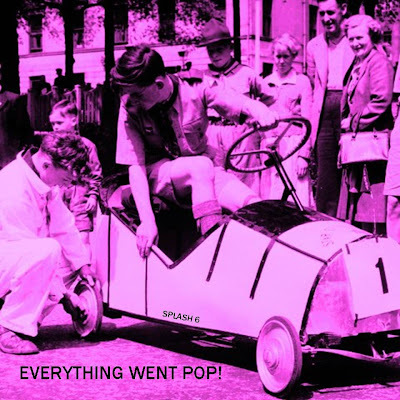 What I want is for more of you to experience my fascination with the "c86" period of indiepop, as the birth of today's indiepop. You should go exploring too! This podcast is of course not nearly enough to cover all of my favourite bands, but I've tried my best! It includes some of the bands I thought should have been on CD86. It simply thrills me honey, writing about these groups. And equally thrilling is having someone like Ally from the Trout Fishing In Leytonstone fanzine discovering and reading my blog. What will happen in 2007? Will people still care about what happened in 1987 (which of course gave us more quality indiepop than the year before it...)? Was 2006 the last great surge of interest in c86, or is it the beginning of one of those things some people call a 'revival'? Who knows. Numbers as well as the prices of eBay items tagged with 'c86' certainly have increased during the last six months. Hopefully it won't become the specialised, elitist interest of some bourgeois merchants. I for one am looking forward to next volume of The Sound of Leamington Spa, due to be released early next year. Hurrah! is one of my four favourite bands. Like a The Action of the eighties. This is the b-side of their first single, so obviously a bit older than the rest. But I could have chosen any one - what made them great in 1982 was the same thing as in 1986. But after that though, they WERE quite close to becoming "the next U2". This is the best out of the four songs released by Scottish The Clouds, and there's no disputing about it. It is simply one of the best songs ever written. From the heartfelt lyric to the brittle yet discordant guitar-sound. A classic. This band has grown immensely on me this year and I've grown very fond of the singer's sardonic style. The song that really made me change my mind was "Violently Pretty", or rather the demo of it put up on the fan-run MySpace page. This song was released on single only. The quintessential c86 band if you will. It's always eluded my why this fantastic song was not included on Matinée's R Is For... Razorcuts compilation. It's from one of their Subway eps. I recently bought the split-flexi with The Badgeman that this song comes from, but Iain from the band beat me to punch putting it up for download! It was their first released song - from 1987 actually. I find it very hard choosing a fave track by this band, because so many of them are best! "Ballon Song", "Inside", "Miles Away", "Cut", "Come Get Me", "Hay Fever", "Dust Remains", sometimes even "Hold On". Usually my favourite is "Sure to See", but when I put this together I decided to go for "Like Dolphin" instead, with its ingenious bass line. This song is so much better that anything I've heard with The Shop Assistants proper. "Something to Do" was actually the first single, recorded by David Keegan and assorted Glasgow indie scensters, including Stephen and Aggi (who's singing here). C86 was not all sweet melodies and naive lyrics. It could be political, confrontational, scratchy and ear-piercing. Subcity put my show on a Monday, because that was supposed to be their 'chill out' day. This sort of thing is likely to mess their plans up, which is always fun! This is the song that gave name to the blog you see linked to the right. Big Flame is the only one of the Ron Johnson/shambling whose genius I have fully understood as of yet. This is a great example of how to build up musical anticipation. The dropping bass line is probably the crucial element. This song from the BBC Sessions compilation and I've always wondered why the singer sounds completely different here than on the albums. Can someone clarify, please? This lyric is actually quite trite, but I love it all the same. Just because it's the sort of lousy attempt at poetry that any desperate person in love could have created. I've chosen the album version, because I adore the way Vince Keenan sings here - and rhythm section is better too! It really stands out as the tragic ballad it truly is there as well. Were Remember Fun not really a paisley underground band? This song certainly suggests so. It's from Egg Records' latest compilation and will be included on their future retrospective on this underestimated Scottish band. David Westlake's outfit The Servants are also among my top favourites. Perhaps the best band on the actual tape? There's just such an unearthly style to everything he puts his hand to. I couldn't decide between this one and their first single "She's Always Hiding", which is equally amazing. He deserves to be up there with his idols Robert Forster and Grant McLennan. There's something about the bands on Sombrero. Beyond most of them sharing members... Something that makes people pay a LOT for their records. I would too, if the money went to the bands or the label! Torquil Macleod's own band was called Reserve and only made two singles, due to numerable reasons. Perhaps they were not as important for survival as The Siddeleys, but it's a close race! Torquil helped Johnny Johnson put her first songs to tape, and the rest is history. Just check out the Slum Clearance compilation from Matinée if haven't already owned it for years. This is one of the most hard-edged, uncompromising songs I know - still it's so, so feeble and beautiful. At least you can walk tall until you fall. Here is McCarthy's first single, released by Wall of Salmon. It's a long way from later songs like "Get a Knife Between Your Teeth" and much closer to the sound of their ever-present comrades in The Wolfhounds. But the Marxist politics have always been there of course. The Wolfhounds pretty much stuck to their sound, though it did become more and more heavy. In the early days they could be cacophonous but still quite brittle, which this song from the "Anti-Midas Touch" 12" is a perfect example of. Their first album is full of this contradictory contrast too. Don't miss David Callahan's DJ set at HDIF if you're in London tonight! The interview I did with Dave and Dave was meant to be attached to this, but I still haven't edited it yet. Look for it soon. Here is the superior 1985 version of the first track on Kettle, it's from a Shop Assistants split-flexi. I don't know if it's something to with the flexi, or they way they recorded it, but that lead guitar sounds really far out! The only band that could beat The Wedding Present at their own craft. Feel the one-and-a-half minute adrenaline surge of this track from their only ep. That it was produced by Paul Haig is not hard to hear! Well, The Wedding Present do match up on a few occasions too. This Peel session cover of Orange Juice's "Felicity" is quite a fast one. Could you play that fast? There was a reason that Primal Scream was at the epicentre of what happened in 1986, and it wasn't just Bobby Gilliespie's star quality. Jim Beattie was a perfect pop guitarist, wearing his 12-string Rickenbacker like no one before. This is an unreleased Peel session track, and sometimes I think it's their best effort ever. They should have asked you to do that CD86 thing, really. It was great fun listening to the podcast yesterday on the train. keep it up... and post some more c86/jangly music... Thanks! Just a minor correction: though Torquil McLeod was a friend of the Siddeleys, and certainly recorded Johnny's early demos, he was never a member. sorry allan! will change it asap. nice to hear from you¨! allan kingdom - what a joy to see you correcting stuff. post xmas bored random computing sends me here. drop me a line if you fancy via www.flickr.com/photos/dusty7s. grand to see the lovely reserve out there.